Our diverse range of water solutions is designed to cater to all your home and business needs. Our range of hot and cold water dispenser models have been created to provide numerous delicious water options including chilled, hot and room temperature water. We have benchtop and free standing models to suit any home or workplace. Hot and cold water cooler models feature innovative technology that is designed to offer optimum energy efficiency. You can choose a hot and cold water filtration system that features insulation to minimise energy consumption, yet allow you to have immediate access to cool, cold and hot water when you need it, without it costing the earth. There is no need to worry about exorbitant energy bills with energy efficient access to delicious, filtered water all day, every day. The Aussie Natural Filtration product range is designed to satisfy all your water needs. 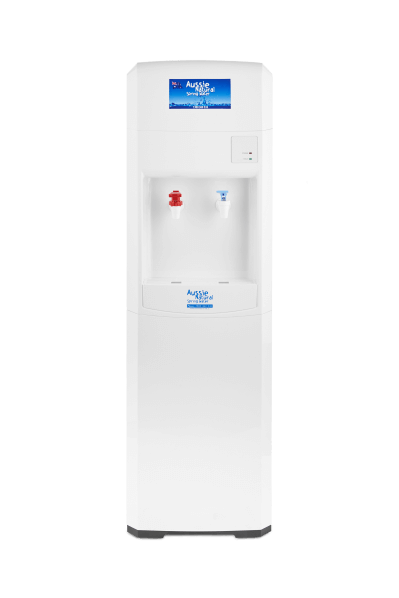 Our hot and cold water dispenser models are designed to require very little user involvement, yet offer maximum functionality. You can quickly quench your thirst with a delicious chilled drink or make coffee, tea or hot soup with minimal effort. This is a fantastic space saving resource for offices with limited space, as the dispenser can be easily located in a staff kitchen or break room. It can also be an invaluable resource in any home, allowing you to make hot drinks in an instant and have immediate access to delicious, chilled water. Our hot and cold water dispensers eliminate the need for a kettle or water heater to prepare hot drinks and can reduce the need for a fridge large enough to provide chilled water for your team. With a footprint of approximately one square foot, our dispensers allow you to benefit from multi function features for the ultimate convenience and practicality. Unlike many unattractive or bulky units, the Aussie Natural Filtration product range is designed with sleek designs to add to the aesthetics of any room. With the modern features and stylish designs, our hot and cold water dispensers are not only practical but also visually appealing. Whether you choose a bench top dispenser or a free standing unit, you can be assured that it can be fitted into your available space without dominating the area or creating a cumbersome imposition in your room. If you are considering your options for a hot and cold water dispenser, you should contact us. We have a wide range of products including various models of water filter, hot and cold dispenser models and filter coolers. A member of the Aussie Natural Filtration team would be delighted to discuss your requirements and guide you through our product range to help you to determine which option is best for your home or business. Hot & Cold water filter systems are available to rent at competitive pricing. Enquire now for the latest pricing.